A few times on a stroll around Camden we had passed by a dilapidated looking little shop front called Camden Coffee Shop. Usually this was on a Sunday and the shop was closed, from the look of it maybe permanently. Well, last Saturday we both needed to stock up on beans and I suggested we try the Camden Coffee Shop, hoping it was open on a Saturday, A quick google revealed it was indeed open on Saturdays, and had loads of glowing reviews, hmm - this could be a good find I thought. I got the 168 bus down to near Delancy street, hopped off, turned the corner and already a waft of deep dark roasting coffee hit my nose. Approaching the store there was a queue 3 deep, so I stood outside and awaited for my usually late brother to arrive. 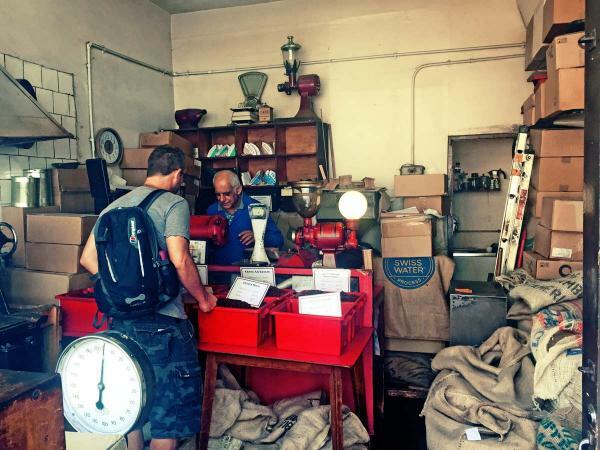 Entering the shop was like stepping back in time, very small and full of vintage equipment, bags of un-roasted beans and with the most amazing smell of roasting coffee. 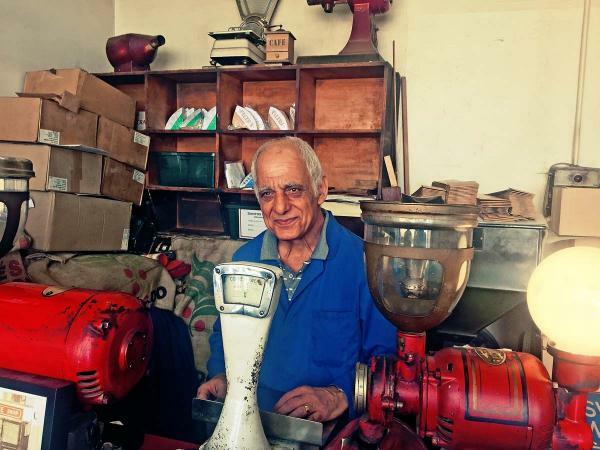 The proprietor George opened the store 39 years ago and is by all accounts a bit of superstar, having been featured by Time Out and numerous others who have stumbled upon his shop and felt the need to write about it! We hung around for 30 minutes and watched as George processed 2 batches of Santos Dark, George's favourite and strongest flavoured roast. 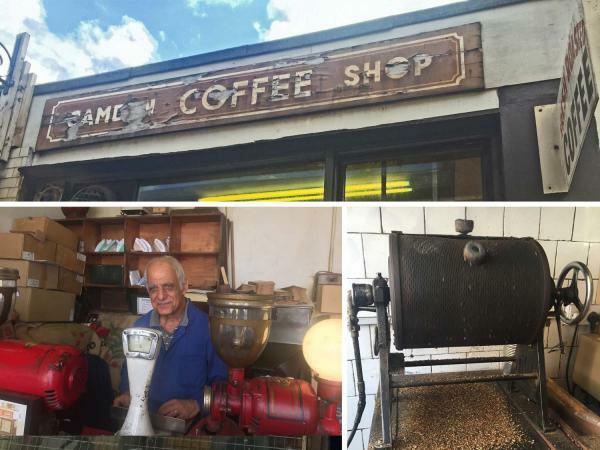 Using a really old looking gas fired rotary roasting drum George dumped in around 2 kilos of beans, fired up the roaster and set it spinning. The bean casings slowly came out through the drum and towards the end of the cycle a light smoke started to come from the drum. 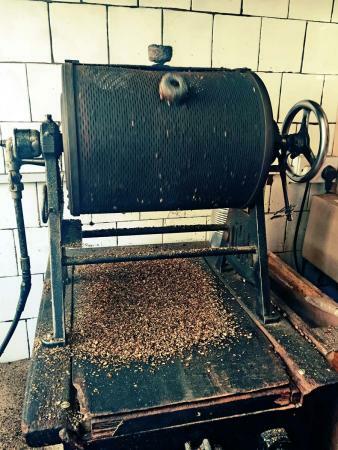 George then opened up the roaster and let the beans fall out into a wooden tray with a huge plume of smoke! Most importantly, the coffee tastes great! Ground with a hand burr grinder and brewed with an electric espresso machine the Santos Light has a light nutty flavour with a punchy amount of caffeine. The Santos Dark has a much stronger and richer flavour. Both were very smooth, with absolutely no bitterness, something George repeated a number of times! I've included a video below, the sounds of popping and the smell were very special, although the smoke emitted at the end was like inhaling a triple espresso! Well anyway, as others have done I felt the need to share this experience. 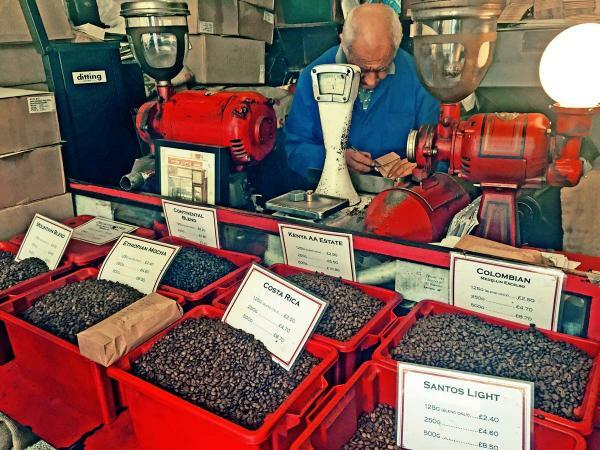 If you live locally or are visiting Camden I highly recommend popping in and getting some beans, whole or ground to your preference, and at very reasonable prices! 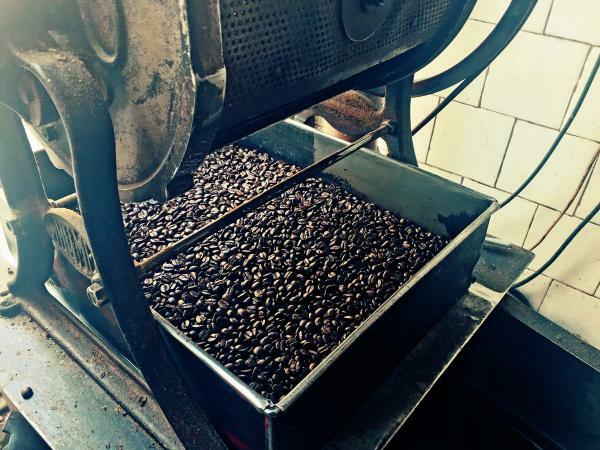 Tags for this post: coffee, camden, roasted beans.